It’s not often that one’s most memorable experience of an Olympics is the Closing Ceremony. Triathlete Katie Zaferes arrived in Rio more than halfway through the Games. Her event was on the 15th of 16 days of medal competition. Zaferes, a podium contender in her Olympic debut, finished a disappointing 18th on Copacabana Beach. She stayed for the Closing Ceremony the next night, the flame extinguished at the Maracanã. Zaferes left Brazil bent on ensuring the next Olympic experience would be different. It’s looking that way at the halfway point of the Olympic cycle. The 29-year-old leads this year’s World Triathlon Series standings going into the Grand Final in Gold Coast, Australia, on Sept. 15. The math: whoever finishes higher in the Gold Coast race — Zaferes or Brit Vicky Holland — is crowned world champion. Zaferes is the extension of the U.S.’ recent surge in Olympic-distance triathlon. It earned one medal (a bronze) from the first four Olympics with triathlon from 2000 through 2012. USA Triathlon’s development program plucked the former University of Wisconsin runner and swimmer from an Ernst & Young accounting job in 2010. It took Jorgensen four years to become world champion and six to win Olympic gold in Rio. She left triathlon last year as arguably the most dominant athlete in its short Olympic history, eyeing gold in another sport. Zaferes, too, was an NCAA distance runner (at Syracuse) and had youth swimming experience. She even raced four triathlons, a Father’s Day tradition with her dad starting in 2007, just after graduating high school in Hampstead, Md. 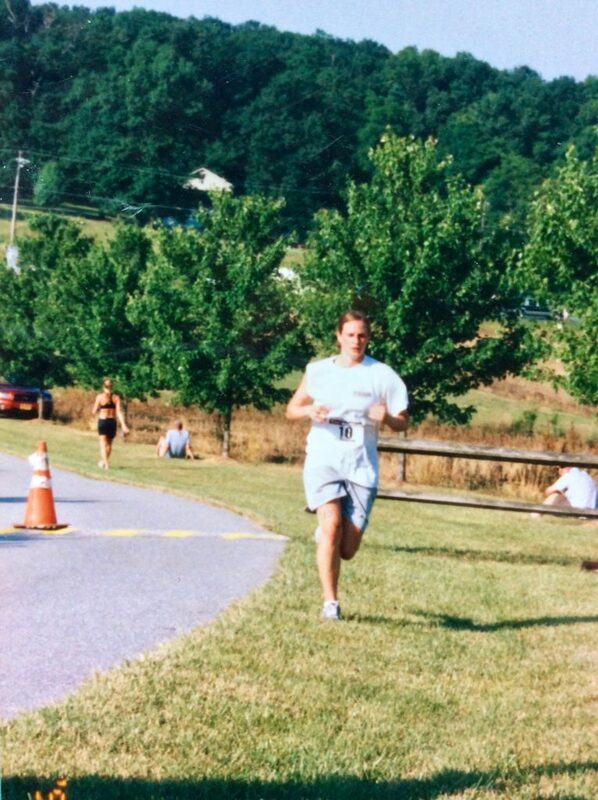 There is an image that made the internet of Zaferes, in a baggy shirt and soccer shorts, in her first triathlon. At one point, she walked her bike up a hill. She finished 11th among women, taking 1 hour, 24 minutes, 8 seconds to cover 400 meters in a pool, 14 miles on the bike and 5km on foot on the Maryland roads and grass. She beat her 46-year-old dad by 28 minutes and trailed the 50-year-old female winner by 11. Zaferes raced it each of the next three years, improving to third in 2008, second in 2009 and the first female finisher in 2010. While at Syracuse, Zaferes was recruited to triathlon by the same woman who had persuaded Jorgensen, 2004 Olympian Barb Lindquist, who heads USA Triathlon’s collegiate recruitment program. Zaferes graduated from Syracuse in 2012, nannied for a bit, and then moved to the U.S. Olympic Training Center in Colorado Springs in January 2013 to begin a triathlon career. She finished fourth at the April 2013 national championships, then won a lower-level international World Cup event in July. Zaferes debuted on the top circuit, the World Series, six days later, and finished 35th out of 65, just 13 seconds behind American Sarah True, who had been fourth at the 2012 Olympics. She was ranked 16th in the world in 2014, racing as Katie Hursey. She married fellow triathlete Tommy Zaferes in January 2015 and, racing with a new name on the front of her suit, truly joined the sport’s top echelon. Zaferes made her first World Series podium and stayed there, finishing second or third in six of her eight starts. She then got her first win at the last World Series race before the Rio Olympics. She was second out of the 1.5-kilometer swim and with the leading group of 18 off the 40-kilometer bike at the Olympics. But that bike leg, covering two tough climbs on each of the eight laps, zapped Zaferes. She followed the bike with the slowest 10km run of that leading group — 38:44, or 4:35 slower than Jorgensen and 42nd out of the 48 finishers. A month earlier, Zaferes had the second-fastest 5km run in her maiden World Series win, 33 seconds slower than Jorgensen, known to be the best runner in Olympic-distance triathlon history. Zaferes stuck with coach Joel Filliol‘s training group after Rio. She now leans more on a nutritionist and sports psychologist. Her husband isn’t racing full-time anymore but works in triathlon, allowing them to travel and train together. Zaferes was third in the world last year, her best overall result yet and her first time as the top American. She also placed second in the 2017 Grand Final, ending a string of fading in season-ending events. This year, Zaferes has five podiums in seven starts. Though she has no wins, that consistency put her slightly ahead of the Olympic bronze medalist Holland going into Gold Coast, even though Holland has three victories this season. Zaferes said it wouldn’t mean anything less to earn a world title without an individual race win. She believes in delayed gratification. She’s had to wait two years since Rio. There are two more until Tokyo, which could be her final Olympic run with starting a family in consideration.